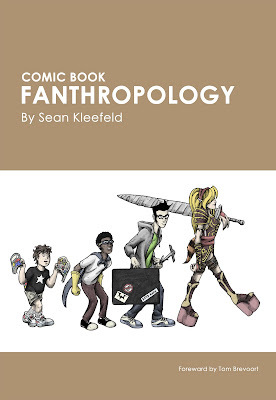 Kleefeld on Comics: Aaaand We're Done! I'll be keeping it online because... well, let's face it: I'm not a 'name' writer and I'm not covering a popular topic. There are more reasons for someone not to buy it if they can't prove to themselves it's worth reading than there are reasons for not buying it if it's already online. This book belongs on your top shelf of your library, up there with Kirby, Frank Miller, Alan Moore, Kipling, Shakespeare, and H.G. Wells! The early chapters of the book are quite good. The discussion of cultural capital is rewarding and thorough. He gives a description of the ritual of buying comic books that I find absolutely wonderful and will quote in my book about Superman. The book's also been linked up (not by me!) to encyclopedic projects like Fan History and Wikipedia. None of which is to say that the book is perfect! This weekend, my buddy Matt graciously sent over a detailed list of around 30 typos and similar errors he ran across. While that's certainly far more than I'd like to have (and ones I'll obviously be correcting in the Second Edition, whenever that comes out) I am relatively impressed with how few problems there seem to be, given that I wrote, edited, laid out and designed the whole thing by myself in two months. (On top of my day job, mind you!) I know I've seen other books written by full-time writers, edited by professional editors, and designed/laid out by full-time graphics folks which wound up having as many, if not, more errors. And I daresay many of those took longer to get from concept to market as well! I'll remind you, too, that using the codeword READMORE2010 when you check out will snag you a 10% discount off the cover price as well. That lasts though the end of January and, at this point, I don't know when I'll be able to offer a discount to you again.